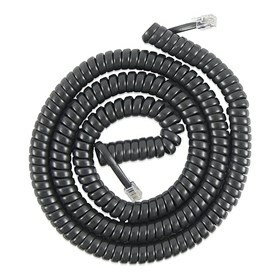 The GE/RCA Handset Coil Cord is a 25ft extension cable that connects the handset to the base of phone. The 25 Foot Black Coil Cord has many exciting features for users of all types. You can extend the lifetime of your 25 Foot Black Coil Cord with the purchase of a FactoryOutletStore Factory Protection Plan. The 25 Foot Black Coil Cord is sold as a Brand New Unopened Item.